Sorry that doesn't ring a bell. it like starts with a "F" but with my mind that could easily be a "C"
I found this article as I was searching for any info I could find on the subject. It talks about cows eating the acorns but we all know that our sweet little furballs with their tiny little bodies could not fight off this toxin the way that a huge cow could! This is so scary and makes me not want to ever feed my babies shelled nuts again! THANK GOD I was going CRAZY (a short drive however) and it is anaphylactic shock I was thinking of ... is a serious allergic reaction that is rapid in onset and may cause death. It typically causes a number of symptoms including an itchy rash, throat swelling, and low blood pressure. Common causes include insect bites/stings, foods, and medications. On a mechanistic level, anaphylaxis is caused by the release of mediators from certain types of white blood cells triggered either by immunologic or non-immunologic mechanisms. It is diagnosed on the basis of the presenting symptoms and signs. "VERY SADLY, I must share my latest experience. I fed my releasables acorns that I froze last year straight out of the freezer. About 36 hrs later (early Friday morning) I found 1 squirrel dead, mid day I found 3 more dead, evening I watched 1 die and at about 5am (Saturday morning) I watched Cayde die too. I lost a total of 6 squirrels and the ONLY thing we can figure is the acorns. I cracked 4 and 2 of those had mold in them. The squirrels in the releasable room were the only ones to get sick. They have eaten and been exposed to EVERYTHING exactly the same as the sqs in my bedroom (NRs and flyers) EXCEPT for those acorns. I only put them in that room. It's been about 21 hours since anyone died so I hope with every ounce of my being that all who ate them have beaten it and that my remaining babies will be alright. I've just checked on all of them, given them all kisses, and put them back to bed. This CANNOT be something that is contagious b/c I constantly go room to room with the same clothes on and my NRs go in there to play, and some of the releasables come in here to play at times too. A contagion would have gotten to all of my angels, not just the ones in that room." And I contacted Leigh (Henry's) about it. She asked some questions and I answered via email. It answers most of your questions. the mold when I first open them b/c it was still fuzzy before it dried over night. I'm still trying to collect myself so give me a few days. I haven't lost any for 38 hours so hoping it stays that way. No one else appears ill and I have them all caged and watching them in that room (the ones that i fed those acorns to). found him really. When I found him, I noticed Cayde was REALLY fluffed up (like a sick bird) and I caged him, gave him subQ fluids and ABs. I watched and waited as he got weaker and weaker and died. He was vomiting when I put him in the cage. I caged him about 5 PM and at 5 am he died. Foamy vomit at the end, but it started as food he had eaten. They were all exceptionally healthy... I didn't notice a fever but research says they probably spiked one. My Vet is out of town until Monday so I haven't seen her yet. I couldn't find anyone else to see them here. of the ones in the room (still alive and some of the dead ones), their fur around their genital area looked like it had been wet (it was dry but stuck together, separated) and had an orange-ish tint. The ones that peed on me while giving meds, their urine smelled really strong. None of my sqs had diarrhea. Poops were still good. I did not find vomit anywhere else in the room. And EVERYTHING except the acorns were in my bedroom (I have 3 NR greys and 11 flyers and 1 chippie in my room) too. It could NOT be a contagion b/c I constantly cross contaminate the rooms and my NRs go in that room and those escape and play back here a lot. They are always intermingled. They all died within a 25 hour window. Approximately 36 hours after I fed the acorns, I found the first one dead. them all so very much..."
If I decide that anything else is useful I'll post it. And the other photos...This is a pic of the one that dried over night. I am so sorry! Thank you so much for sharing. I have a bag of frozen acorns that I will most certainly toss in the garbage now. I have always been told that you should eat everything that comes out of the freezer in the next 24 hours and never to refreeze stuff that comes out of the freezer . And to toss away everything from your freezer if it stops to work for some time or you leave the door open for to long . If that's right it could be that the acorns have been out of the freezer for to long or it could be that Uni's freezer stopped to work without her noticing and in that case she could have a lot of rotten ( human and animal ) stuff in her freezer and risk big problems . For what I know you don't notice the food is rotten , but it's bad to eat . Could someone please tell this to Uni just in case !!!!!! So, so sad....none of us who loves and raises squirrels should ever have to go thru this. Remember also, folks, that freezing does not kill mold or bacteria in food. It merely puts it 'in stasis'. Once the food thaws, molding begins again, immediately. Refrigeration slows the process and freezing stops it, but only until thaw. I was under the impression that the acorns on the ground would not be good, to always take them right from the tree. I know this is harder, but wasn't this written some where on here? I had ordered acorns once from, www.acorno.com/ and 3/4 of them were floaters, never ordered again and didn't use them. This is also a reminder that squirrels , while still in our care, do not have the natural instinct as to what is bad for them like the ones out side. This has nothing to do with our raising, and hopefully it kicks in after being outside for a while. I do not give my NR's ANYTHING from outside that cant be baked in the oven at 200 for and hour. No bugs, slugs, muck nothing. I don't release so I don't know what to do for them, this is a learning process for all of us as we all want what is best for all babies that come our way. Bless you Uni for being brave enough to come forward and tell us, you are my hero for this week !!! They are more similar to chestnuts than you might thing. Cut open an acorn and you will find a sort of wet, fibrous heart that is sort of like stringy chestnut - it is nothing like the dry tree nuts like pecans, etc. Furthermore, the shells often have holes and split that outside moisture can get into. 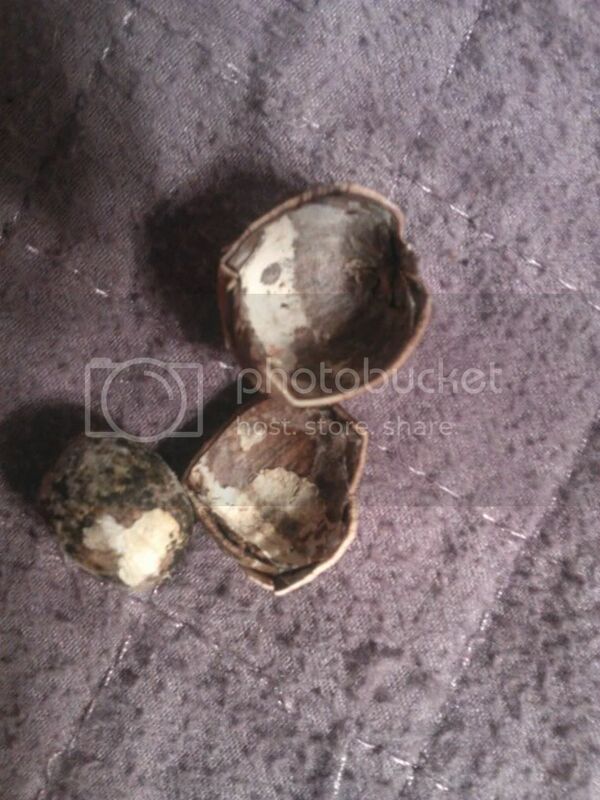 So you are looking at "wet" nuts that have kind of weak shells. That last part means that any time spent laying on the damp ground is just opportunity for mold to get inside. When the acorns are in season, I usually lay a tarp down on the grass under one of the oak trees in the early evening, and go out in the morning and pick up what has fallen on the tarp overnight. They are green and just released from the tree - they have never touched the ground. They get examined for holes and splits, thoroughly washed, and frozen while still green. Needless to say, power outages mean problems as they need to remain frozen. But given all of that, I will also begin to chop them in half before feeding them. Uni - Thanks for posting this info. I am so sorry this happened. this will most likely save the lives of many many little squirrels. it has been a concern in the Sugar Glider World for years, thats where I first hear about it. Glider Central --has an article on how to cut down on this problem ! I am watching the thread, thank you all for the kind words. I am monitoring though to be sure to answer any questions on the subject and even hoping someone will have a question that we haven't thought to ask yet. I also noticed that someone (sqs chewed laptop charged, can't see who on my phone) mentioned the possibility that they had defrosted and been refrozen at some point. To my knowledge they have not been defrosted since I froze them. Perhaps this is a myth then. I had asked Uni if she handed them the nuts individually since I had heard with a captive squirrel to always offer at least two nuts and let them chose the one the want, because squirrels can tell a bad nut. The theory goes, since they look at us as their "protectors", they believe that whatever we hand them is safe and will even eat a bad nut. When I used to feed tons of squirrels on my deck,I would throw out pecans by the handful. I noticed at least 6 different squirrels one after one smelling and then rejecting this one large nut. I went outside to collect it after a while, and it was cracked, it looked ok inside, but it was a curious observation. Yes, but you will note that she said they don't get nuts very often. I think when they have free choice of lots of nuts - like you have when they start to fall from the trees in the autumn, they examine and get quite picky. But I bet they eat a lot more "marginal" nuts when there are not that many to choose from. Not that you want to give your squirrels unlimited nuts, but it sure is a reason to closely examine what you turn over to them and how you store. This is heartbreaking. I have stopped feeding acorns. I had noticed my outside squirrels would examine them and then drop them. I thought 'are they being picky or do they know something I do not?' I tossed all I had. I know they have a much higher risk of aflotoxin then many other nuts. My heart goes out to you, Uni. I cannot even imagine. I had noticed we had terrible acorns the past 2 years, very small, my wilds go through many many many before they find one to actually eat.